A tiki bar is really cool, but it is not complete unless you have great looking stools to sit on and enjoy your favorite beer or blender drink. You can use almost any chair or stool that is high enough to reach the bar, but to get the full effect you need something that matches your tropical bar or looks authentic. The picture to the left is a tropical bar with stools made from plans by Tiki Kev. This is one style of stool that I think looks authentic and it matches the bar. 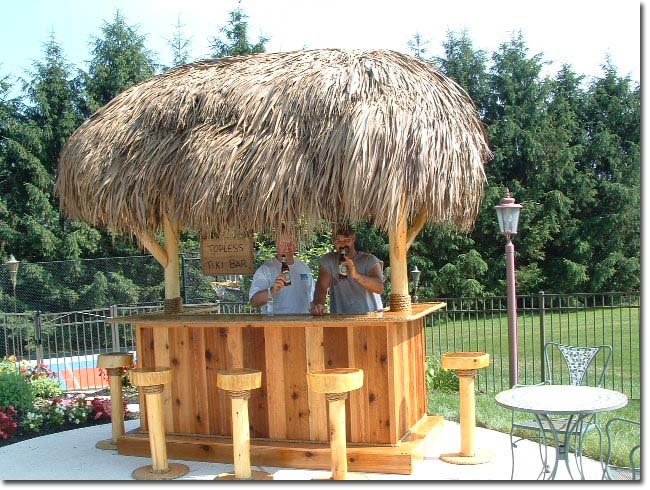 Kevin has made a lot of tiki huts, bars and outdoor stools and he used all of his experience to make easy to follow plans. If you would rather not make your own bar or stools, you can have Tiki Kev build them for you. He is still making these tropical structures and loving it. The question I hear most often is how do you make a tiki bar stool? I’m not going to go into all of the details here, because all of the information and more is in one of Tiki Kev’s books on this topic. In his ebook you will find all of the information to also build a tiki bar table. So if you need more table space, this is the perfect thing to build your self. If you are looking for information, please click on tiki bars and stools.